House area - 230 m2. Year of construction - 2004. Number of floors - 3 + underground garage. - Solarium with a sea view. Possible installation of light-weight structures and jacuzzi. - Garage for 1 large car or 2 small, comfortable entry. Distance to the Boadella beach - 550 m walking(320 m in a straight line), distance to the beach Fenals - 1 km walking (650 m in a straight line). The complex has a communal swimming pool, a children's playground. 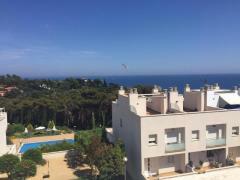 A good opportunity for renting - the rental price for 1 week in August - 1,500 Euro. Annual property tax IBI - 1,500 Euro. Insurance - 300 Euro per year.